Pay-per-call is a performance based advertising program that allows phone calls to be tracked like leads. 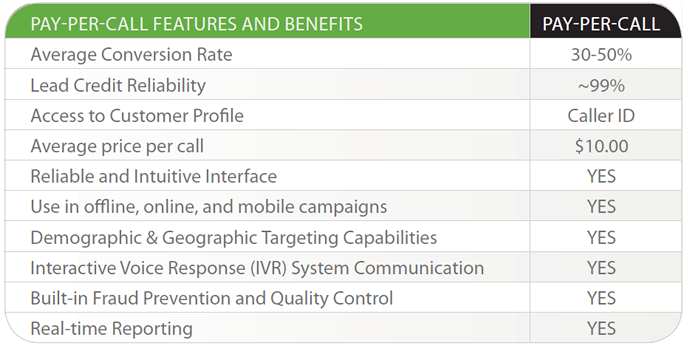 Designed specifically for the performance marketing industry, RexConnects allows advertisers to create campaigns that connect customers to the business by phone. It allows Affiliates to use unique, trackable toll-free numbers to promote offers and get paid for the calls they produce. Why Pay-Per-Call for your business? FOR ADVERTISERS: You can drive more traffic through the affiliates by offering high-value products and services that typically require a consultative sale and close over the phone. You can also reach a much broader audience as affiliates now have access to additional channels such as offline, mobile and local. FOR PUBLISHERS: You expand your business and increase commissions by promoting offers to more diverse channels such as offline, mobile and local. You will get credit for qualified phone traffic you send to advertisers. And because phone calls typically convert at a higher rate than clicks, and carry a higher average sale price you have the opportunity to earn much higher commissions.